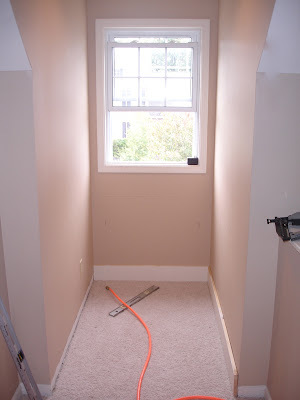 You may remember a few years ago, I shared with you how we claimed some unused space in our upstairs hallway to create a mini office area. My husband constructed a DIY built-in desk inside a small space provided by one of our dormer windows at the top of our staircase. If you missed the original post on this project, you can catch the steps he took to build the desk here. We named this project the "Office Nook". When he was finished constructing the desk, I gave it a coat of white paint, added a glass top to protect the wooden surface and introduced a new family computer. At that point, I called the Office Nook project complete. Since then, each member of our family of five has used this area every day. It's turned into one of the most hardworking spaces in our home. Even though it's one of the most used areas, it's definitely been one of the most neglected from a style standpoint. 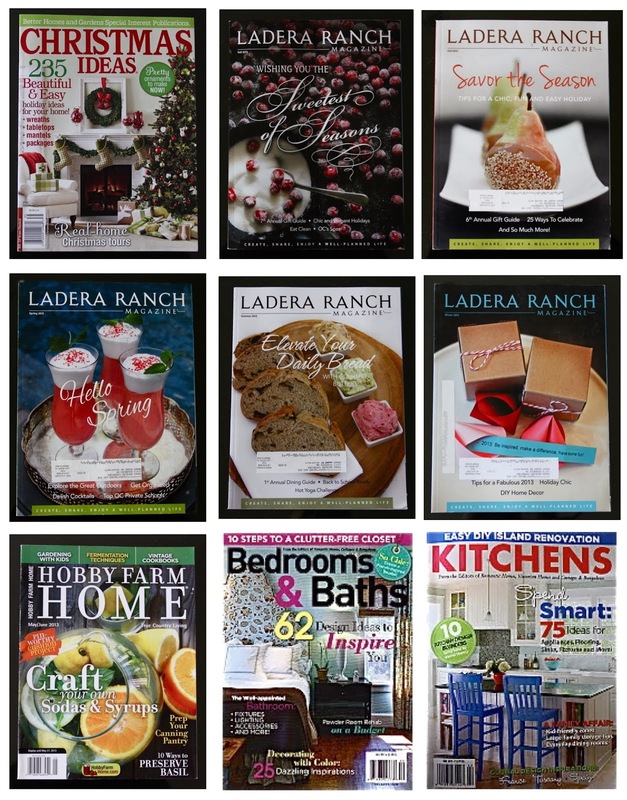 One quick trip to HomeGoods last week, and that is no longer the case. This little space has gone up a few notches not only in style, but also in comfort and function thanks to some unique finds at HomeGoods. 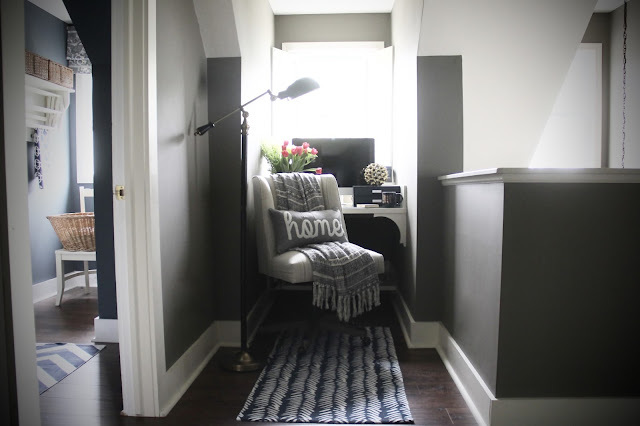 I was able to turn our Office Nook into a "homey" office area that makes excellent use of a small space, works as a hardworking family work station and looks beautiful to boot without breaking the bank. My goal was not only to give this area style, but also to make it feel like a small sanctuary where we enjoy spending time. Since the space is so small, there isn't a lot of room for unnecessary decor. In order for me to give our Office Nook personality without crowding the workspace, it had to be done with carefully selected necessities. And this amazing office chair covered in a gorgeous striped upholstery fabric. To help protect the light fabric from little ones with orange Doritos hands, I selected a beautiful light weight throw to place over the chair. 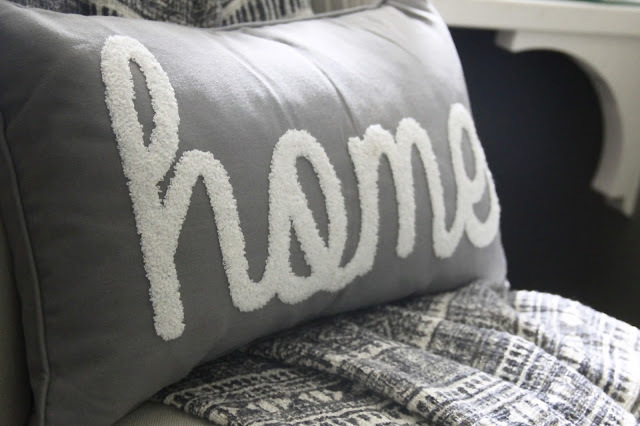 Nothing says home like a cute pillow that says home. Having a computer screen right in front of a window is both a blessing and a curse. It's nice to have the view outside while working on the computer, however certain times of day the sun can cause this area to become hot. 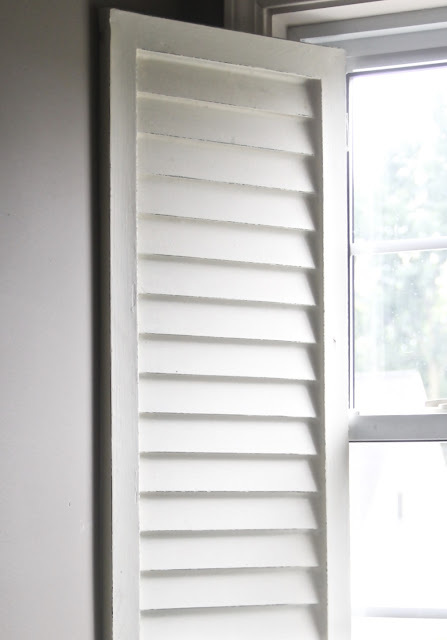 I added a pair of vintage shutters to the window that can be closed as needed. They added a little bit of time worn personality to the space as well, which was nice complement to all the new merchandise. One of the reasons I love shopping at HomeGoods is that I can find just about anything. When I went shopping for this styling project I reflected on how my family uses this space daily. When it comes to my time spent at the family computer, it usually involves a cup of coffee. When my husband and the kids are using the Office Nook, it is usually in the evening. This meant a lamp would help to make the area more user-friendly for them. HomeGoods is one of my favorite places to shop for unique lighting at great prices. 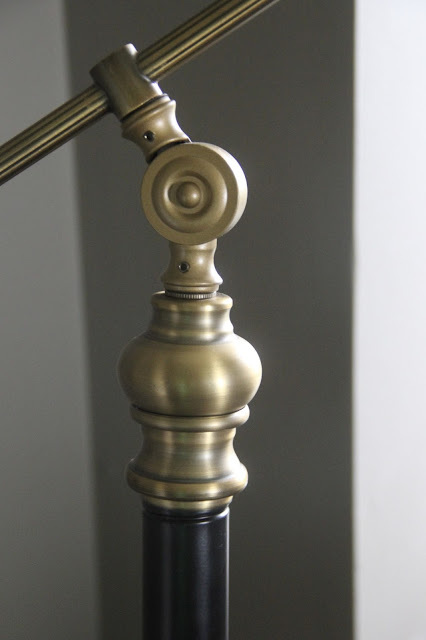 I found an amazing floor lamp with black and gold details. 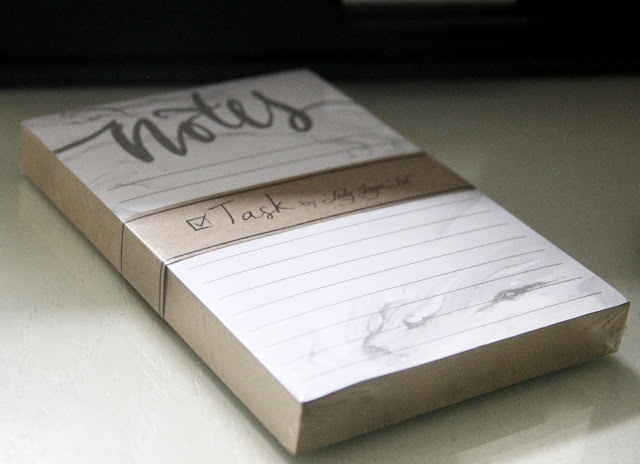 Check out this adorable notepad, it's so much cuter that the yellow sticky notepad we've had next to the computer for the last few years. 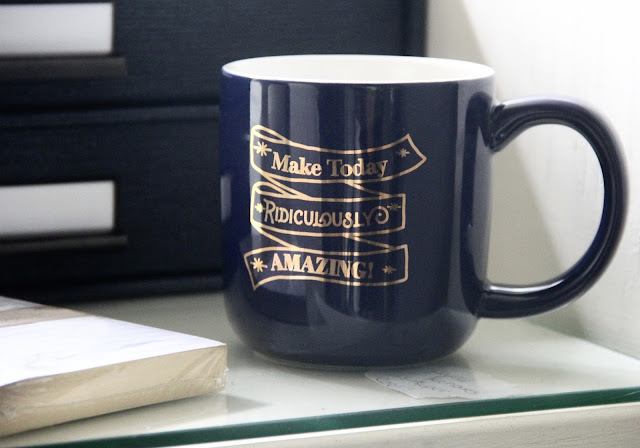 Who said office accessories can't be pretty? 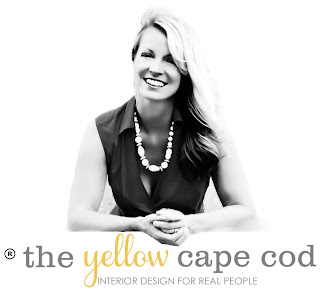 Another reason I love to shop at HomeGoods is that you can find designer merchandise for just about anything needed in your home, even for areas like an office that may require things that typically wouldn't be considered attractive. Not only are the prices great and the style top notch, but you get the quality of designer merchandise. Our Office Nook has a more inviting look now, but more importantly has become a more comfortable and functional space. The new office chair was by far my favorite find. It has an adjustable base that allows all of our family members the ability to raise and lower it depending on our personal preferences (and heights). 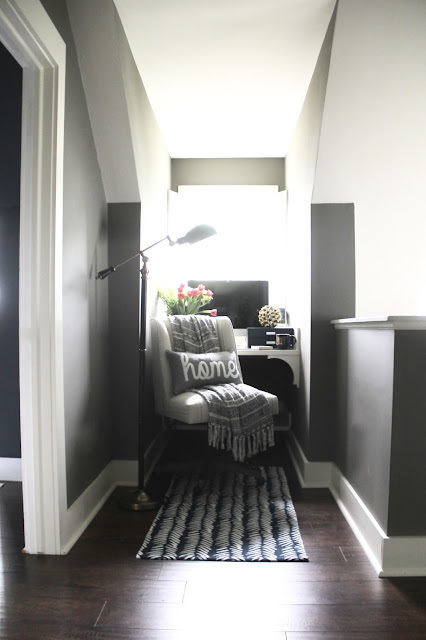 Even though our Office Nook is a small area, it packs a big design punch in the upstairs hallway. Previously, it was wasted space, now it's a hardworking, functional, unique, custom design feature in our home. 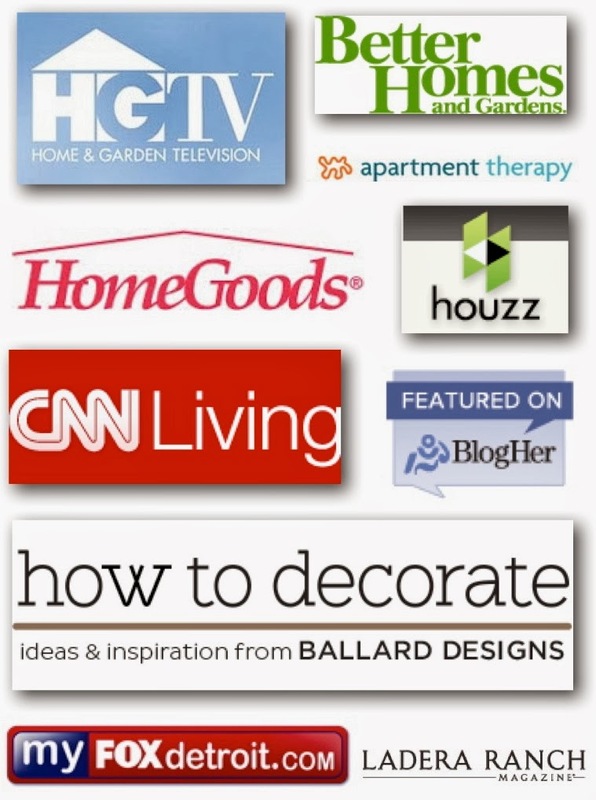 Visit HomeGoods on Facebook and Twitter. 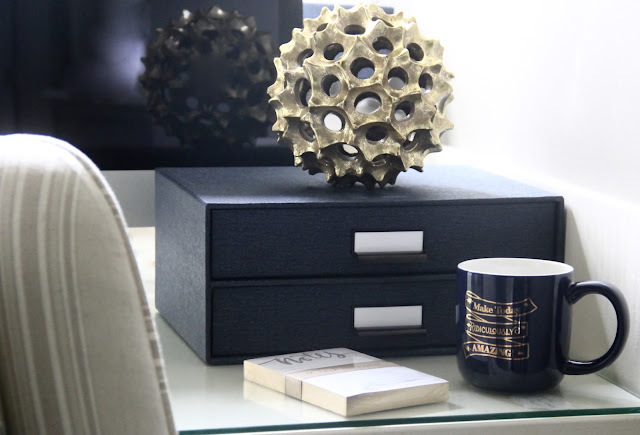 Get inspired and check out this video with HomeGoods and Sutton Foster teaming up to make her dressing room feel like home! 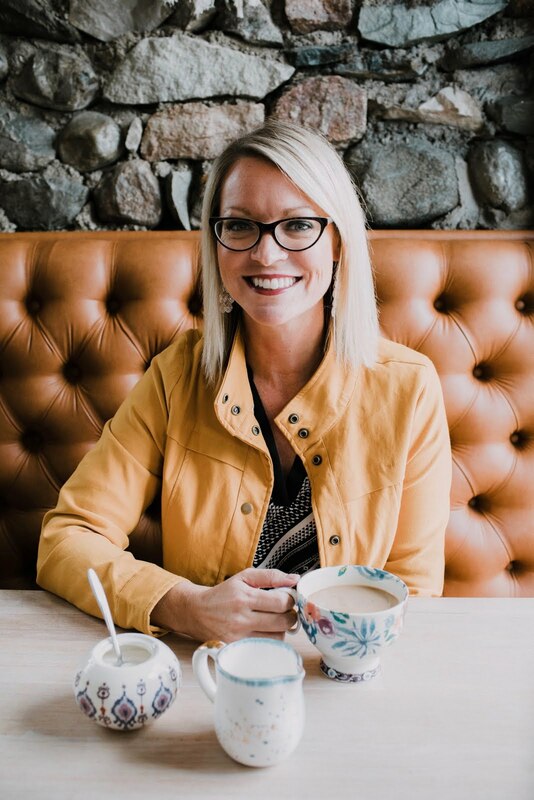 I can't brag about my HomeGoods finds without giving you a chance to win $100 Visa Gift Card to spend on your own HomeGoods finds. Tell me in the comments what space in your home is the most hardworking, but neglected from a style standpoint and you will be entered to win. *This post is sponsored by HomeGoods. My views and opinions are my own. My kitchen. It works the hardest but it desperately needs to be styled to fit our style. It still has a border of pears. The area in our home where we keep shoes and coats hanging up. Sort of like a mudroom, but its just part of a hallway. 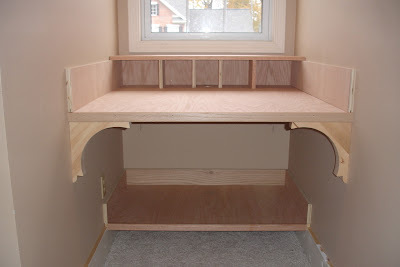 It has a wall shelf organizer with coat hooks and a shoe cubby bench. It would be nice to spruce it up with a new rug under the bench and decorative pieces above the shelf organizer. I'm embarrassed to say that it is the Master Bedroom. The desktop computer is in our bedroom--because it is the biggest room in the house. I need my work area be neater and look more organized. 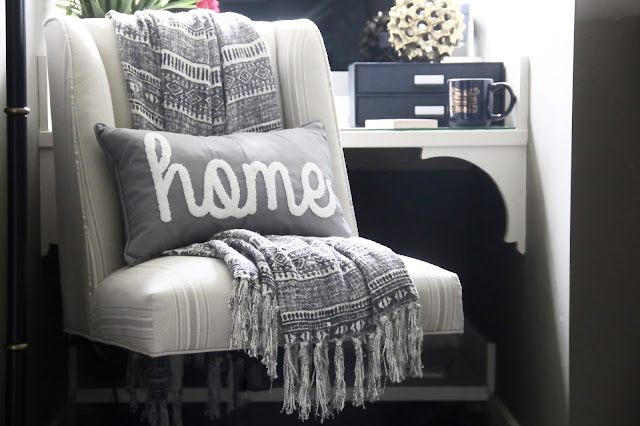 Our home office is hard-working space that could really use some HomeGoods love! Thanks for the inspiration. The space in my home that is the most hardworking, but neglected from a style standpoint is the kitchen table area. I have a combo laundry room, office and pet room that has a serious lack of style but it's where we spend the most of our time it seems. Either with homework, laundry or dog. Our dining room currently functions as a work area/ desk too... Poor thing :( Love the transformation! Our family room is the most hardworking, and it could really use some design help. Also the kitchen! Definitely the family room. It needs some updating as well as better storage solutions for toys. Love the office! That looks awesome. My laundry room is mostly neglected, but definitely hard-working, as it also serves as the guest powder room. Probably our kitchen. It's a small yet hardworking galley, though we didn't decorate it and that's obvious (it has wallpaper as a backsplash! )...a HomeGoods recently opened literally up the street from us and I'm loving it so far even though it's smaller than the previous location we'd shop. our office is great from a function standpoint, but definitely needs some help on the style front! I love the upholstered chair - all of it really, but that chair! What fabric is that? That would definitely be my den. It's where everybody hangs out and it is SOOOO outsdated! we moved two years ago, and I feel like its the knicknacks and final decorating touches, the things that really complete a space, that I need. Home Goods is THE place for that! My family room is in need of some cheering up! My laundry room is the hardest working area in my house, but by far the most neglected! It is also our entry from our garage, so I see it all day long! The family room: everyone uses it daily throughout the day and never gets an update or a refreshed look. My living room needs a makeover with new chairs, couch and new everything. It has been neglected for years! I love every room in our home minus our master bedroom. It was sort of left last and we just havent got around to it. It is having a serious identity crisis! I would love to spruce it up a bit. My laundry room is the most hardworking, but it needs style. Our dining room also works as an office for my husband and homework/craft station for the kids and could use some major sprucing up! My laundry room is hardworking but really needs some help. The home office/video game room is the most hardworking. Our family room, we spend the most time there, yet it lacks in appearance. Beautiful use of a neglected space! Our hardest working, most neglected space is our laundry room! My laundry room/pantry needs some love and atention! Our kitchen is the most hardworking and could use a makeover. My laundry room is hard working but unfortunately doesn't have the best style. Our computer room could use more style. It's a bit cluttered right now. Our family room is where we spend the most time. It can really use a update. Thanks so much. Definitely our kitchen! It needs a lot of help right now, but it is the most often used room in the house as we cook almost all of our meals at home. My home office could use a makeover. It's overrun with papers that need their own place. My kitchen is definitely the most hardworking...but yeah, no style. I love how you make over the office. so nice. That would definitely be my family room. We spend so much time in there but it really lacks any kind of style. It's more of just a functional room than a fashion statement. The office is the hard working and neglected at the same time. Excellent use of space and very beautiful! my living room is definitely the most neglected and hard working! My kitchen is the most hard working! I spend a lot of time in there. My entrance needs a major overhaul, but I have no inspiration and can't think of what to do with it. My kitchen really needs a makeover. Around here, the kitchen is definitely the most hardworking room, and there is no style whatsoever going on there. I think maybe it's time to rectify that! My bedroom (which doubles as my home office most days) works hard for me in daily life, but desperately needs a makeover!! Your re-do looks amazing. I think it might be our dining room / kitchen that needs a re-do. It would have to be my living room. We spend a lot of time here! We use our "bonus room" as a computer area, toy room and a family gathering space. It really could use some organization and decorations. I have an office space that is really just a corner of my living room, dreadful I now! I feel that it could be pretty if bought a shelf and had those cute organizing basket drawers. I would love to redo/update my daughters room. She is a straight A student and all she has is basic furniture. I would love to spruce it up with some style and flavor to reflect her preteen age. My daughters room is highly use, but less styled. She is a straight A student and we just put basic furniture in her room. I would love to update her room to reflect her preteen age with not only function but style. I would have to say the kitchen is the most hard working and lacking style in my house. My home office is used several hours every day but it isn't at all welcoming or even marginally attractive. My office is the most hardworking, but neglected. That room would be our kitchen. It's so in need of updating! My kitchen is the most hardworking and most in need of updating. hmm that is hard. I would say it is a tie between my bathroom and my kitchen. Those two rooms get used the most harshly for sure and both look like they are stuck in 1985! hahaha! The space in my home that is the most hardworking is my kitchen, and I know that it is a little neglected from any type of style standpoint. I'd say our dining room. We eat there every night, but I don't spend a lot of time on the style or decor of the room. That would be my bedroom/office. My bathroom gets used a lot but is neglected when it comes to style.